The town of Qufu has three basic attractions: the Temple (built around the house that Confucius grew up in), the "Forest" (the Kong family cemetery where over 100,000 of Confucius' descendants are buried in the last 2500 years), and the Ming-era mansion compound where the descendants of Confucius lived a nobility. 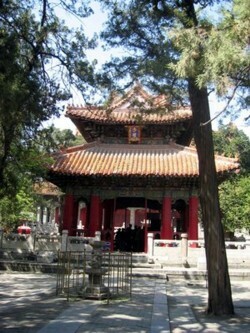 The temple itself is the largest Confucian temple in the world. It dates to 478 BC and takes up a fifth of the town's area. Fifty-three stele tablets have been erected by emperors there over the centuries. The temple has 466 buildings which cover 22 hectares of land, making it one of the largest architectural complexes left from ancient China .